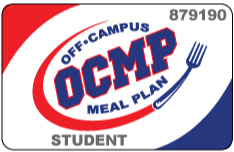 The Off-Campus Meal Plan has been designed to specifically meet the unique needs of college students and their parents in the college environment. 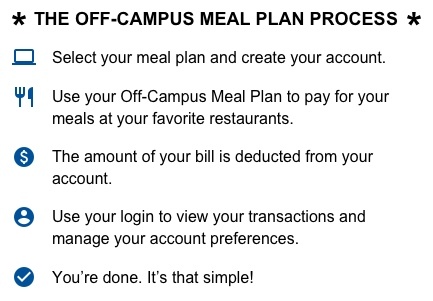 It is a flexible meal plan that allows student to eat at a diverse selection of restaurants very close to campus and dormitories. The card is swiped by the restaurant or grocery store and the value f the purchase is deducted from the total number of meals on your account. After the purchase both the student and parent can easily view the account balance on the computer and see an up-to-date log of all transactions. It can’t get much easier than that!